Yes, I know it’s August – but my new Christmas cards arrived yesterday from moo.com, and I wanted to share them with you. The idea, you may remember, was to paint an example of a post box from the reign of each monarch, finding them all in the roads of Lexden, where I live. The earliest boxes there are date from the reign of Queen Victoria, when the letter post first began. My Victorian box is from Lexden Road – the main road into Colchester from the west. My King Edward VII box is from my own road, Heath Road, and is, in fact, contemporary with my house which is also Edwardian. The next one is King George V, which is on Straight Road, then a very rare King Edward VIII box in Glen Avenue. As he was never crowned – he was the King who abdicated as I’m sure you remember! – there were hardly any post boxes with his cypher, in fact only two in East Anglia. Lastly there is a King George VI box in Queens Road. 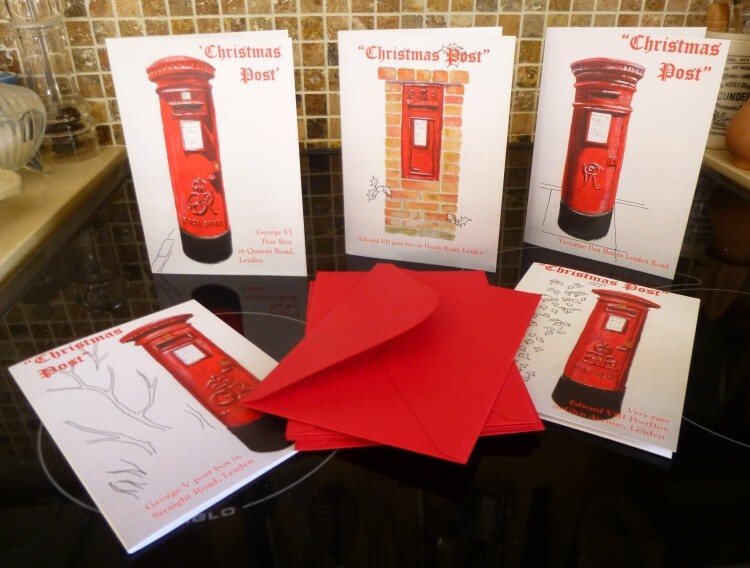 Each of the cards says ‘Christmas Post’, and then the date and location of the post box in smaller writing. I added the text to photographs of the paintings, and then had them printed by moo.com, and I went for red envelopes as I thought they would be more Christmas-y. I shall be selling them initially in bundles of five, one of each design, at Open Studios, but I shall also have some individual cards for sale. I’ve been framing two dinghy paintings for the Geedon Gallery today, as they will need to go over very soon – Poppy on the Blackwater, and Waiting for the Tide.